Sometimes you might not be able to print because a "job" has got "stuck in the queue". A print "job" is a printout of one or more pages. The "queue" is where prints go before they reach the printer. The purpose of the queue is to allow you to start printing something else while the last document is still printing. Sometimes the queue goes wrong for some reason and then you need to clear the queue. 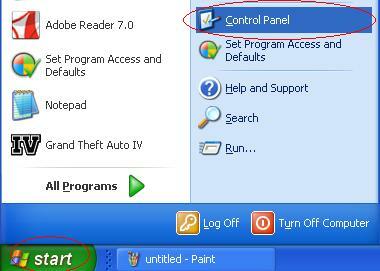 Click Start menu, then Control Panel. Double-click Printers control panel, or single-click "Printers and Other Hardware". The Printers control panel will be shown. Look for the printer you are trying to use. In this example, I am using an Apple Laserwriter and it has 5 items in the queue. Double-click the printer icon. An icon is a small picture that represents something. Don't click on the printer's name, or the computer might think you are trying to change the name. The printer queue will be shown. Here we can see what is wrong. The first item in the queue has not printed for some reason, and 4 more documents are stuck in the queue after it. 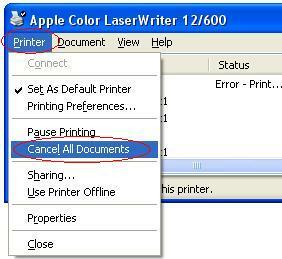 Click Printer menu, then Cancel All Documents. You will be asked if you are sure, click Yes. The printer queue should be cleared, ie empty. If one item won't go away, turn the printer off and on again. If it still persists, turn the computer on and off again. The printer icon in the Printers control panel should now have 0 jobs in the queue and be Ready. Try printing again now and it should work normally.